As a distinct discipline, Customer relationship management (CRM) has been in existence for over twenty years. It’s essentially a model for improving the relationship between companies and their customers, using technology as an aid. As with any new technological paradigm, CRM had a bumpy start, and skepticism about the effectiveness of systematizing something that many people felt should be done intuitively and organically was rife. Yet, after a period of evolution, CRM began to show a measurable return on investment for firms that were doing it right. Recently, a Nucleus Research study showed that CRM delivers, on average, a return of $5.60 for every dollar a company invests in it. Statistics such as this have helped the CRM industry to grow markedly in size, and according to a recent Gartner survey, it is expected to be worth $36 billion worldwide by 2017. Despite the success of the industry to date, CRM is still considered a disappointment by many, as while it has had a marked effect on efficiencies, it hasn’t really delivered on the promise of improving the customer’s experience with a company. The intrusion of automation into the customer experience has had the effect of making customers feel less valued than if they received personal attention. This drawback can be addressed, to a certain extent, by understanding the needs and interests of each customer, but this is easier said than done. Prior to the emergence of social media, companies would use data from transactions with their customers, such as purchase history, contact info etc. to inform their interactions with customers. This didn’t exactly paint the whole picture, but it was better than nothing. But with social media changing the way that customers interact with companies in a profound way, a new, more informed version of CRM has emerged – dubbed “Social CRM”. Because it’s such a new discipline, a concrete definition of Social CRM has yet to emerge. Perhaps the most dominant definition at present states that social channels such as Facebook and Twitter and online customer communities are integrated with traditional CRM channels such as email, phone, SMS, and in-person meetings. 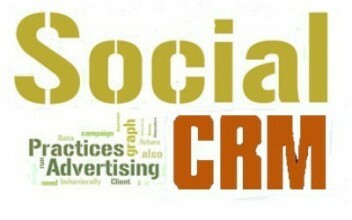 Basically, Social CRM is a holistic approach, that drives all the interactions between customers and companies. While standard CRM can be considered a science that tries to reproduce the way humans interact, social CRM brings the customer into the loop a bit more, so that their voice can be heard more clearly – and the company can tailor their approaches to them with far greater sensitivity. While the world in which we run our businesses has been changed beyond recognition by the communications revolution, the principles of business remain steadfastly unchanged. The communications revolution has changed the way we communicate, first with the telephone replacing in-person communication, then with email, mobile, and most recently social media. It has increased the frequency of communication, in the form of constant status updates, and the increased the expectation of near-instantaneous communication. Perhaps the biggest impact in terms of customer trust is that it has shifted it away from institutions towards individuals. A gauge of consumer trust produced by Edelman, called the Trust Barometer, was introduced in 2000. Back in 2003, the most trusted sources by far were financial experts and industry advisors, with “a person like me” – i.e. someone that the respondents to the survey perceived to have similar tastes, ideas, and cultural biases – accounting for just 23% of the vote. In the space of just one year, this figure rocketed to 51%, and in 2012 it was 65%. And where do people find these trusted sources? Increasingly, the answer to this question lies in social channels, and business executives are starting to realise that they need to leverage these channels in order to build stronger relationships and establish greater trust with customers. A recent study of CEOs shows that 88% of them felt that their highest priority over the next five years was to get closer to customers. This has gone in tandem with the increasing priority of CRM for businesses, with it now being considered the 8th most important initiative for CIOs having been 18th the year previously. Companies of all sizes are realising that while they have no control over the social channels that their customers use, or what they express on these channels, they can at least give them the means to deepen their relationship with a brand and share their experiences with their network. This is what Social CRM provides, and that’s why your business should care about it. In this series, we’ll be looking at strategies for successfully integrating this discipline into your business practices.